Here you will get Part-II ofChapter Notes for CBSE Class 9 Science, Chapter -The Fundamental Unit of Life. In this part you will learn about various types of solutions and modes of transportation of different materials in and out of teh cell. These notes prepared by the subject experts, are completely as per the latest syllabus for CBSE Class 9 Science. In this article you will get CBSE Class 9 Science notes on chapter 5 ‘Is The Fundamental Unit of Life’ (Part-II) . These chapter notes are prepared by the subject experts and cover every important topic from the chapter. At the end of these notes you can try the questions asked from the discussed set of topics. These questions will help you to track your preparation level and get a hold on the subject. Plasma membrane permits the entry and exit of certain materials in the cells. Therefore, it is named as selectively permeable membrane. It is the process of movement of substances from a region of high concentration to the region of low concentration until uniform concentration is finally acheived. During the respiration, due to the difference of the concentration of carbon dioxide (CO2), inside and outside of the cell, CO2 is given out a waste product, moving out from region of high concentration to region of low concentration. Similarly, oxygen (O2) enters the cell by the process of diffusion when level of concentration of O2 inside the cell decreases. It is the process of movement of water from its high concentration region to its low concentration region through semi-permeable membrane. If the medium surrounding the cell has a higher water concentration than the cell, i.e., if the solution is very dilute solution, then the cell will gain water by osmosis. Such dilute solution is called Hypotonic solution. Endomosis: Though water molecules are free to pass across plasma membrane in both sides but more water will enter inside the cell. The cell will therefore swell up and increase in volume. This process is called Endosmosis. If the medium surrounding the cell is of exactly the same water concentration as inside the cell, there will be no net movement of water across membrane resulting in no change in size of cell. Such solution is called Isotonic solution. If the medium surrounding the cell has a lower water concentration than inside the cell, i.e., if the solution is highly concentrated, then the cell will lose water through osmosis. Such concentrated solution is called Hypertonic solution. Exomosis: When the water moves out of the cell placed in a highly concentrated solution, it wall cause the cell to shrink. This process is known as Exosmosis. The biological phenomena of exosmosis when a cell or tissue is placed into a strong hypertonic solution, is termed as plasmolysis, whereas the reverse process is cytolysis, which occurs if the cell is placed in a hypotonic solution resulting in a lower external osmotic pressure and a net flow of water into the cell. It can take place in any medium. It can take place only in liquid medium. Semipermeable membrane is not required. Here the diffusing molecules may be solids, liquids or gases. It involves the movement of solvent molecules only. It is dependent on the free energy of the molecules of the diffusing substance only. Here the diffusion of the solvent molecules is affected by the presence of other substances (solute) in the system. An equilibrium in the free energy of the diffusing molecules is achieved. Equilibrium in the free energy of the solvent molecules is never achieved. Plasma membrane renders the transposrt of many molecules of biological significance. Such essential molecules are moved across the membrane by special proteins called transport proteins or permeases. This process of forced diffusion of certain substances through the plasma membrane is called mediated transport. Note: Permeases used in the process are quite specific to the substance they transport. (i) Facilitated transport/diffusion: Here, the permeases assists a molecule to diffuse through the membrane that it cannot otherwise penetrate. (ii) Active transport: In this case, the energy is supplied to the system to transport the molecules in a direction opposite to a concentration gradient. It is the process of ingestion of materials by the cells through the plasma membrane. It describes all three similar processes: phagocytosis (cell eating), potocytosis (cell drinking) and receptor-mediated endocytosis. 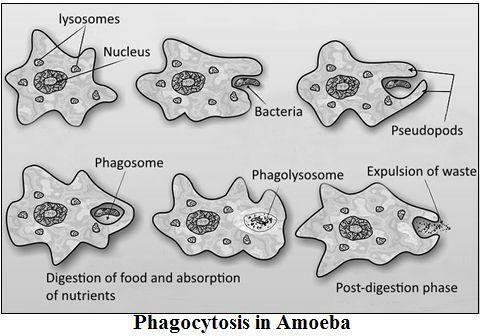 Phagocytosis: It is a method of intake of food materials by certain organisms like protozoa (Amoeba). The flexibility of the cell membrane enables the cell to engulf the solid particles of food and other materials from its external environment. In this process the membrane of a vesicle can fuse with plasma membrane and extrude its contents to the surrounding medium. This process is also named as cell vomiting. Remove the undigested residues od=f substances brought in by endocytosis. Transport a substance completely across a cellular barrier. Q1. Why is the plasma membrane called a selectively permeable membrane? Q2. How do substances like CO2 and water move in and out of the cell? Discuss. Q3. How does an Amoeba obtain its food? Q5. Differentiate between endocytosis and exocytosis. Q6. Why does the skin of our hands shrink when we wash clotehs for a long time?